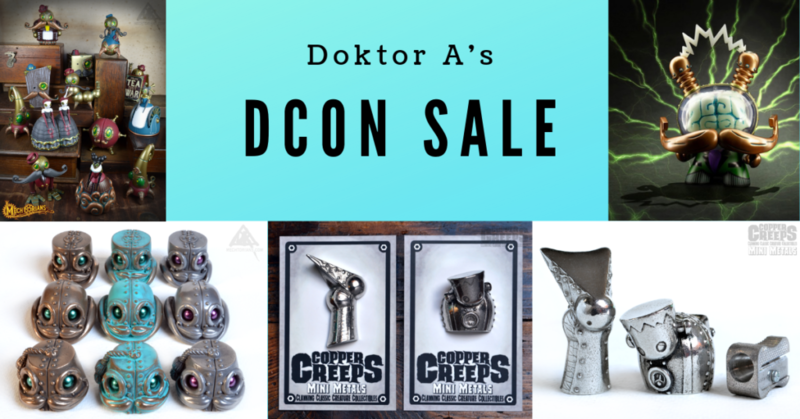 DesignerCon is over, but that doesn’t mean there’s nothing left to buy! Doktor A has added his remaining stock to his webstore. First up are the Titfers. Will you get The Topper, The Bowler or The Fez? Do you want a pewter, bronze or verdigris finish? So many choices! But at £15 each ($19), why not get them all? These little guys are hand cast, 1″ (about 2,5 cm tall) and the edition size of each version is 100 pieces. Got your hat? Than you’re ready to further expand your mini Mechtorian collection! The mini Metal Copper Creeps are now available online. You can get either The Bride or The Monster at £13,50 ($17) each or spoil yourself and get them both for only £22 ($28). Prefer a pin? Same characters, same quality, same price! As a Dunny and GID fan, I also love Doktor A’s GID Cognition Enhancement Engine 8″ Dunny. With an edition size of only 150 pieces, this version is the hardest one to get. Luckily Doktor A still has a few of these beauties available for £165 ($211). Last but not least, you can also support Doktor A by buying blindboxes of his amazing Mechtorians series. Get one blindbox for £18 ($23), two blindboxes for £35 ($45) or four blindboxes for only £65 ($83). And if you are looking to get all 14 characters at once, a little Mechtorian birdy told me that AP sets are coming soon!